If you're an expert software QA tester looking for a new job, see how you can best market your credentials. To be the successful job candidate for quality assurance jobs, it helps to have a comprehensive resume, says resume expert Kim Isaacs. This sample resume that she created below for a senior QA tester can give you some ideas. 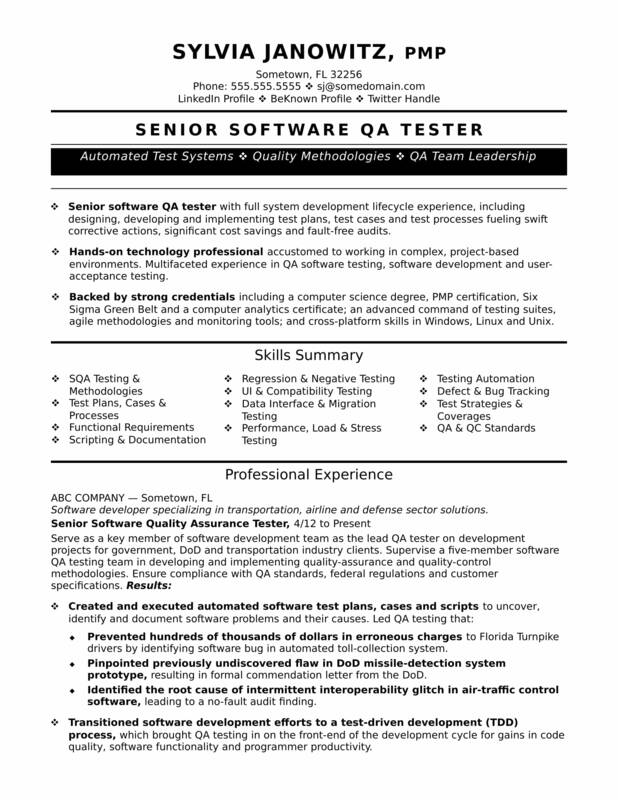 You can also download the experienced QA software tester resume template in Word. Jobs for QA software testers are projected to grow by 9% (or 54,400 jobs) from 2016 through 2026, according to the Bureau of Labor Statistics (BLS). You’ll find the highest level of employment for this job in the following states: California, Texas, New York, Ohio, and Virginia; and in the following metropolitan areas: New York City, Washington, DC; Dallas, Chicago, and Houston. In this job, you can expect to make a median wage of $88,270 per year, or $42.44 per hour, according to the BLS. Additionally, you can learn more about technology careers on Monster. Senior software QA tester with full system development lifecycle experience, including designing, developing and implementing test plans, test cases and test processes fueling swift corrective actions, significant cost savings and fault-free audits. Hands-on technology professional accustomed to working in complex, project-based environments. Multifaceted experience in QA software testing, software development and user-acceptance testing. Backed by strong credentials including a computer science degree, PMP certification, Six Sigma Green Belt and computer analytics certificate; advanced command of various testing suites, agile methodologies and monitoring tools; and cross-platform skills in Windows, Linux and Unix. Software developer specializing in transportation, airline and defense sector solutions. Prevented hundreds of thousands of dollars in erroneous charges to Florida Turnpike drivers by identifying software bug in automated toll-collection system. Pinpointed previously undiscovered flaw in new DoD missile-detection system prototype, resulting in formal commendation letter from the DoD. Identified the root cause of intermittent interoperability glitch in air-traffic control software, leading to a no-fault audit finding. Transitioned software development efforts to a test-driven development (TDD) process, which brought QA testing in on the front-end of the development cycle for gains in code quality, software functionality and programmer productivity. Conducted formal and informal product design reviews throughout the software development lifecycle to provide input on functional requirements, product designs, schedules and potential issues. Leveraged developer background to communicate effectively with software design team, quickly gaining their respect and becoming a valued, “go-to” team member on challenging test cases. External testing group providing quality-assurance assessment of software, hardware and systems. Created company’s first comprehensive database of documented test defects and procedures to enable accurate replication and ensure compliance with standards. Accelerated average QA testing turn-around time by 25% or more, allowing company to accept more testing projects without increasing staff. Designed and implemented automated testing tools and programs addressing areas including database impacts, software scenarios, regression testing, negative testing, error/bug retests and usability. Documented software defects using bug tracking system and reported defects involving program functionality, output, online screen and content to software developers. Delivered thorough QA testing reports that determined product quality and release readiness. Software solutions provider specializing in mobile technologies. Worked on teams developing state-of-the-art software for mobile devices, including the #3 selling GPS solution in the US (2003). Analyzed business requirements, conducted gap analysis, estimated project scope and worked closely with fellow developers to deliver high-quality software solutions using Java, C#, VBScript, SQL and other technologies. Assisted with user-acceptance testing and defect tracking for three new software releases. Offered full-time UAT position after graduating from college (respectfully declined to accept software developer job). You'd never offer a computer program to the public without testing it for user-friendliness, and the same should hold true for your resume. Looking for a professional assessment to make sure all the pieces are in the right places? Get a free resume evaluation today from the experts at Monster's Resume Writing Service. You'll get detailed feedback in two business days, including a review of your resume's appearance and content, and a prediction of a recruiter's first impression. Make sure your affinity for quality control extends to your job search.